Okay, maybe I should have taken the hint from the Quebec Police Force officer who told me to stay away from any guy called Valentine. But I was intrigued by the mystery man’s $365,000 James Bond car and his belligerent attitude. So I did my research, snagged an interview after pestering Valentine Elin and tempted the fates by writing about matters he would have preferred not be made public. The article appeared in The Gazette of November 22, 1980 and brought his wrath upon my head. The implication being that the only reason I was still breathing, despite the private nature of the story, was that he liked my writing style. Four months later, The Washington Post became aware of the story and did its own piece on the James Bond car that he wanted to promote. ABC’s Night Line followed with an interview shortly after, by which point my audacity had been forgiven. 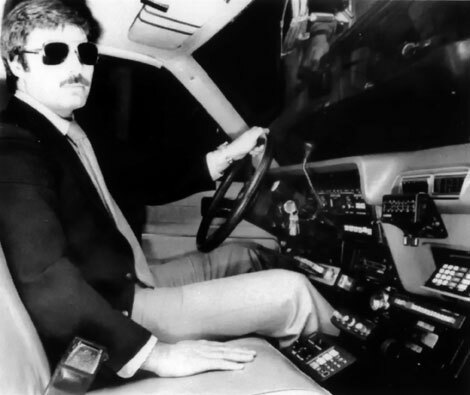 PHOTO:Arnie glasbourgValentine Elin, Montreal’s James Bond, behind the wheel of his nitro-injected Nova. The man described as the James Bond of Montreal is quick on the draw. No weapons this night, just wit. Are you sane? he's asked by a reporter. "My psychiatrist tells me I'm fortunate I'm not insane," he shoots back with a smile. In the world of Valentine Elin, expert in counter-espionage and security, sanity is defined in terms of weapons such as laser pistols, shock-wave guns and bio-rhythmic function disrupters. Some call him the black eye of private eyes. Others say he is a genius, among the best counter-insurgency specialists in the shadowy world of spies, terrorists and assassins. "There's no getting away from it, he's brilliant," says a Quebec Police Force officer. "He's done investigations for governments, but a lot of it is top secret. He knows his business." There is a grudging admiration for the man who just finished building $365,000 worth of anti-terrorist equipment into a '76 Chevy Nova to give safe transport to diplomats of free world governments and business executives who think they might be targets for terrorists. "Supercharged, nitro-injected, switch-pitched and methanol-injected." It has a "double waste gate control, quick shift package, full 12-bolt positraction, anti-sway bars, heavy duty suspension, reinforced frame, ram-and-strike bumpers, photo recording system, tear gas, smoke screen, foam ejection, fire suppression system, mobile phones, communications scrambler, illumination camouflage, night driving television, communications analysis system, heater extender system, gun ports, self-sealing, anti-gunfire gas tank and run-flat tires." Next spring, Elin plans to put on armor plating which could withstand a bomb and could stop bullets from a .357 Magnum or a high-powered rifle. The project was originally commissioned by a government (not the Canadian) as a means to protect its diplomats. But with money from private Canadian business interests (Elin won't say which), more gizmos were added until, voila, a car that can easily exceed 150 m.p.h. Elin's security firm, listed in the telephone book under Counterforce, can build a safe but less costly model for between $80,000 and $140,000 on 90 days notice, Elin says. So far, he's had three orders to outfit cars, which are usually mid-sized, seemingly innocuous vehicles. Elin is every bit as mysterious as his vehicle. "He plays the James Bond role," a detective with the Montreal Urban Community police said. "He likes to play the mystery man. At times he's worked with us, although he's also had problems with the police." Problems such as arrests for assault and possession of stolen property. Neither charge had anything to do with his work and both happened almost 10 years ago. The assault occurred when someone tried to stop him from watching a favorite horror movie on television. Elin punched that person in the eye. The other incident involved an acquaintance who parked a stolen car in his garage. Elin was given a suspended sentence. Those involved in the crime-security business are tight-lipped about Elin. "Get his background from the Godfather," snapped one. "He's been around." But exactly what does Elin do? He does not work with the underworld, although he acknowledges that he has been approached on several occasions. He will not work for any communist or fascist government. His father was killed by the Nazis during the Second World War in his native Romania when Elin was a baby. He loathes dictators. Color him true blue with a touch of cynicism and more than a dab of street smarts. A ninth-grade dropout who, for kicks, managed to spirit a shipment of military and electronic gear from a United States Air Force base at age 15. His company, with offices in Montreal and London, England, provides all forms of security services, from bodyguards to eavesdropping detection and rescue missions. But what is an "ordinary security science specialist" as Elin describes himself doing in Montreal? "I live in Montreal because it is neutral" he said. "When fighting terrorism, I don't want to live in the middle of it. My main market is in Italy, Germany, Spain, the Middle East, South and Central America." Elin is circumspect. He won't say who he has worked for or discuss anything about his personal life in Montreal. "In intelligence work, you don't brag about what you've done or name companies and governments," an MUC undercover police officer who knows Elin said. "Elin is a little strange, secretive, a loner. But he is a good technician. Putting together that car was something else." Elin tells a bizarre tale of his mother leaving Romania with her 3-year-old son and placing him in a fenced-in boys' camp in Natanya, Israel at the end of the Second World War. Discipline was strict. The boys were taught to forage for their food in the nearby countryside and given courses in underwater swimming. They were whipped if they did not behave. He says he doesn't know who ran the camp, but stayed there for five years until his mother returned for him and moved to Montreal, where she has a sister. The next few years were lonely ones for Elin as his mother worked double shifts as a nurse to help meet expenses. They lived on De Bullion St. and Elin attended classes at Devonshire and Bancroft schools. In his spare time, he took apart radios. Then at age 15, he moved down to Pacific Palisades, Calif., to live with his mother's second cousin, who felt he needed closer supervision. But playing trumpet in the school band there was not exciting enough for him. "Every night, I would hot-wire my cousin's car and cruise around Los Angeles in it, but I soon got bored with that," he said. "Then one day, I saw an air force truck dumping electronic and military hardware at an air force base. "I decided to steal that shipment piece by piece. It took me all night." He refuses to say how he pulled off the caper, but it was not a total success. Police followed the trail to his cousin's house and found the goods. Elin was too young to be charged with a criminal offence, but his exploits did not escape the attention of the military. The colonel introduced Elin to a New York City man who had worked during the Second World War in the Office of Strategic Services (which later became the Central Intelligence Agency). "He taught me sabotage and demolition, surreptitious methods of entry, pyro-technics and exotic arms fabrication." Such useful things as how to make a rifle from a piece of plumbing and an elastic band or a flamethrower from an aerosol can and a lighter. How to incapacitate a man in unarmed combat. Elin says he was paid by his N.Y. mentor to do "certain projects" overseas. He refuses to identify the man, other than to say he was with the U.S. government, and he won't discuss specifics of his missions other than to say he worked "on loan to other organizations which had reciprocal agreements with the U.S."
An acquaintance confirmed that Elin also did "security work" in Israel although he is unable to say whether he worked with the Israeli secret police, considered one of the finest clandestine forces in the world. While maintaining his residence in Montreal, Elin would fly down to N.Y. to get assignments from his mentor. He maintained contact with the mysterious N.Y. man until eight years ago when they had a falling-out over personal matters. After that, Elin decided to start his own security business in Montreal, geared to selling security services and consultations to free-world governments and to businessmen worried about industrial espionage. For example, if a businessman suspects his place is under electronic surveillance, Elin will sweep the place with detection equipment at a cost of $2 per lineal square foot and $150 per telephone line. Aside from the work being "heart-pumping and challenging," he says he always works for a "good cause" and believes in what he does. He refuses to say whether he ever killed anyone, but says he has never done anything he regrets. He has never been shot, although a number of unsuccessful attempts have been made on his life. He will not discuss them. His favorite gun is a Walther PPK, a semi-automatic pistol favored by European police forces. However, he does not usually carry a gun, saying they are almost "obsolete" with the sophisticated chemical and space-age weapons now available to terrorists and spies. Such weapons as cigarettes which fire cyanide-coated bullets, ballpoint pens which are mercury fired and umbrellas which inject toxic pellets under the victim's skin. The best protection? A good brain and a silent tongue. Those who talk too much usually disappear. Questions irk Elin. And besides, it's that time of morning - 1 .a.m. - when "security science specialists" sometimes do their best work. Elin slides out from the booth in the dingy, smoked-filled restaurant while the jukebox cranks out another rock tune. "You know, I've been in this game too long," he says as he slides behind the wheel of his spymobile. 'If I had to start all over again, I'd stick with the trumpet."